N-channel enhancement mode logic level field-effect power transistor in a plastic envelope using âtrenchâ technology. The device features very low on-state resistance and has integral zener diodes giving ESD protection up to 2kV. It is intended for use in automotive and general purpose switching applications. PHD108NQ N-channel TrenchMOS logic level FET View NXP Semiconductors. PH9025L N-channel TrenchMOS logic level FET View NXP Semiconductors. PH9030L N-channel TrenchMOS logic level FET View NXP Semiconductors. 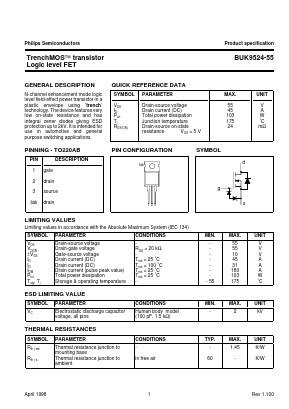 PHP110NQ06LT N-channel TrenchMOS logic level FET View NXP Semiconductors. PH955L N-channel TrenchMOS logic level FET View NXP Semiconductors. PHD96NQ03LT N-channel TrenchMOS logic level FET View NXP Semiconductors. PHD66NQ03LT N-channel TrenchMOS logic level FET View NXP Semiconductors. BUK9535-55A N-channel TrenchMOS logic level FET View NXP Semiconductors. BUK9214-30A N-channel TrenchMOS logic level FET View NXP Semiconductors.